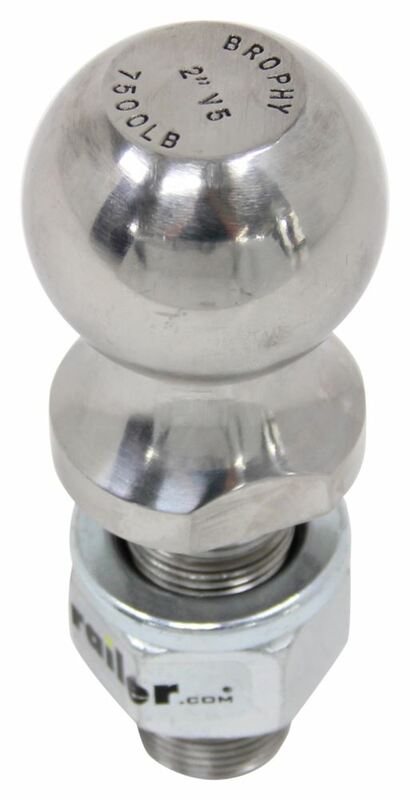 Stainless steel ball has a 1" diameter x 2-1/8" long shank with 14 threads per inch. Wrench flats ease installation. Polished stainless steel is attractive, provides superior strength, and resists rust and corrosion. 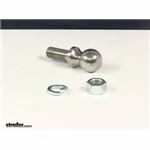 Call 800-298-8924 to order Brophy hitch ball part number SC23-C or order online at etrailer.com. Free expert support on all Brophy products. 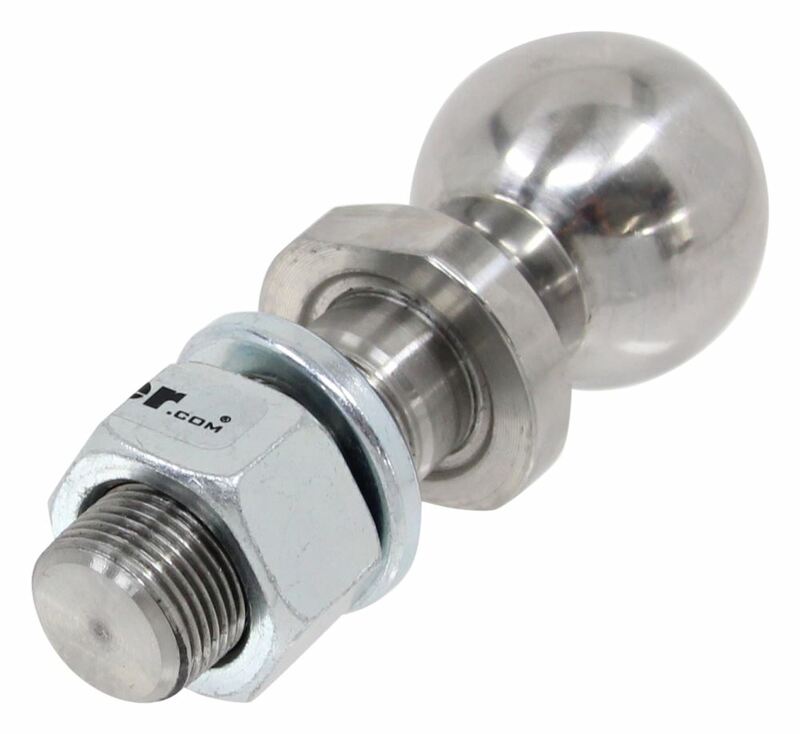 Guaranteed Lowest Price and Fastest Shipping for 2" Hitch Ball - 1" Diameter x 2-1/8" Long Shank - Stainless - 7.5K. 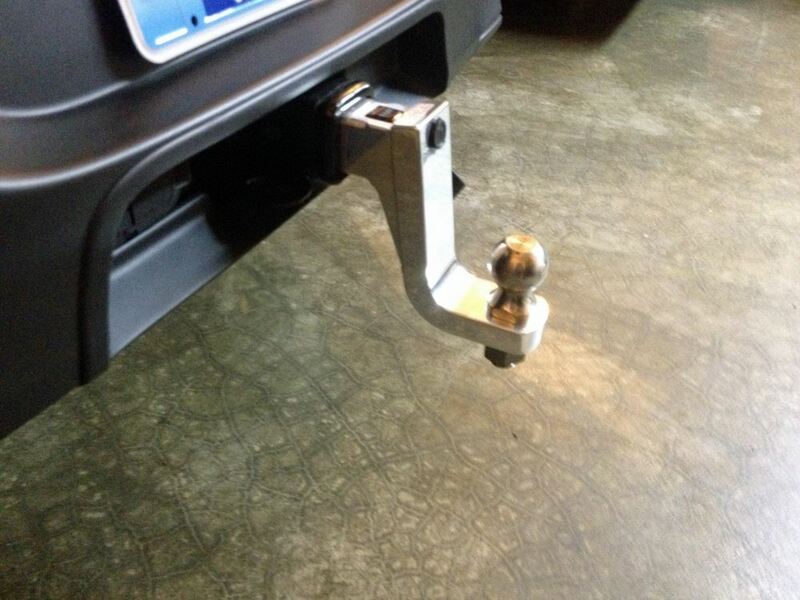 Hitch Ball reviews from real customers. Durable stainless steel ball has a 1" diameter x 2-1/8" long shank. Built-in wrench flats ease installation. Stainless steel delivers superior corrosion resistance. Fine threads provide strong grip. Lock washer and nut included. Ball set with stainless steel 1" diameter, 2-1/4" long shank. Two hitch balls with 1-7/8" and 2" diameters. 10,000 lbs GTW. Superior corrosion resistance. Today we're going to be taking a look at the Brophy 2" hitch ball. The hitch ball's going to provide a connection point for your trailers coupler. The fine threads are going to provide a tight strong grip, this one's going to feature 14 threads per inch. It's made from a durable stainless steel construction that's corrosion resistant and rust proof. It has a polished finish to provide a sleek attractive look. It's also going to feature the wrench flats here on the side. That's going to allow you to use a wrench to hold the ball in place. It makes installation much easier. It does come with the lock washer and the nut, so both of those are included. The ball diameter is 2". We're going to take a look at the shank dimensions real quick. Starting with the shank length. I'm just going to measure the threaded portion, that's going to be 2-1/8", overall length is about 2-1/2". The diameter is going to measure right at 1" in diameter. This has a weight capacity of 7,500lbs. When installing this you would place this through the ball hole on the underside, you'd place on the lock washer followed by the nut and then you'd need to get it torqued to the specifications listed by the manufacturer. That's going to do it for today's look at the Brophy 2" ball with a weight capacity of 7,500lbs..
Order: RelevanceNewestRating - High to LowRating - Low to High Stainless steel ball has a 1" diameter x 2-1/8" long shank with 14 threads per inch. Wrench flats ease installation. Polished stainless steel is attractive, provides superior strength, and resists rust and corrosion. its a great 2 inch ball no rust , light lube on the ball, its as good as day one, would order another for sure. The best on the market. I would buy another for my next vehicle. Looks like new yet. No more rust. Love it !!! Do you have a question about this Hitch Ball? To install the Brophy 2-Inch Hitch Ball # SC23-C on Alumistinger Ball Mount # AM3505 you will use a suitable torque wrench (one like # ALL944001) to apply 250-ft-lbs of torque on the nut. I confirmed this with my contact at Brophy Machine Works. Roadmaster High-Low Adapter # RM-048-6 is intended for use along with a Roadmaster tow bar like their BlackHawk 2 # RM-422 but is not rated for trailer towing, as you noted. Instead you'll want to use a ball mount with the same 6-inches of drop, such as 8K-rated aluminum ball mount # EA60 from Brophy or Andersen's # AM3507. 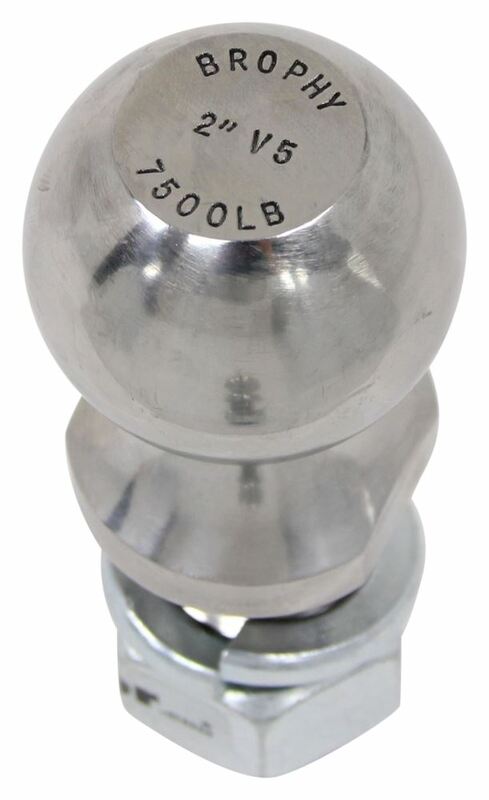 Be sure to use a hitch ball rated for the trailer's weight, such as 2-inch 7.5K ball # SC23-C. Please refer to the linked article and ball mount page. 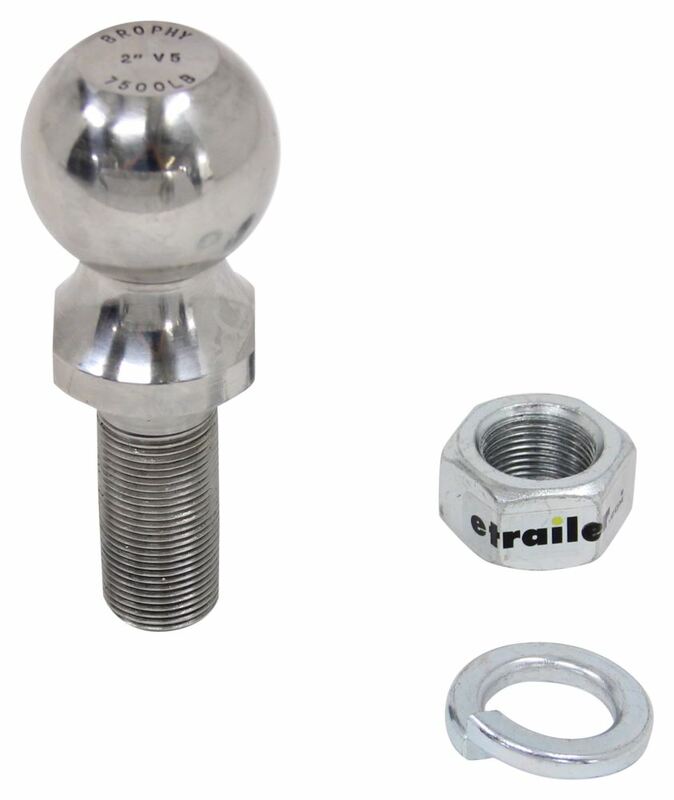 I spoke with my contact over at Brophy about stainless steel hitch ball # SC23-C and found out that the included nut and washer are not stainless steel but do have a zinc plating. This is common for stainless steel balls. The hardware used to secure the ball isn't stainless. Brophy hitch ball # SC23-C is made overseas. For a stainless steel option that is made in the US you would have to go to an interchangeable set, # 903B. I have linked a video review of this set for you. I went to the warehouse and measured the Brophy 2-Inch Hitch Ball, part # SC23-C. The length of the shank from the underside of the platform that sits on the ball mount is 2-1/2 inches. The threaded portion of the shank measures 2-1/8 inch. I have attached a photo of the ball with th edimensions shown. The Curt 2 inch Trailer Ball, part # 40038 would be a good choice for you. The ball has a 1 inch diameter shank with a 12,000 lb capacity. It would work just fine with the Andersen Alumistinger Ball Mount you mentioned. Keep in mind that the towing capacity will be limited to the capacity of the lowest rated component, be it the ball, hitch, ball mount or the vehicle itself. The CR Brophy ball you mentioned would also work well, but it has a lower capacity at 7500 lbs. For a 2 inch diameter stainless steel hitch ball to use with the Ball Mount part # EA40 that you referenced the Brophy ball part # SC23-C would work great. This ball has 2-1/8 inch long shank that is 1 inch in diameter so it would fit the # EA40 well. What you'd need is the part # SC23-C. This is a stainless ball, washer and nut that matches the 2 inch ball size, 1 inch shank, and capacity as it is rated for up to 7.5k. I'm not entirely sure what you're looking for, was it a trailer ball? If so, we have a 2 inch stainless trailer ball with a 1 inch shaft, part # SC23-C. The ball has a 7500 lb capacity. If that's not what you were needing please let me know, I'd be happy to help. The 2" Hitch Ball part # SC23-C is constructed entirely of stainless steel and has a polished finished. It works with ball mounts that accept a 1" diameter shank and trailer couplers that accept a 2" diameter hitch ball. I have attached a review video of the above hitch ball for you as well. I do have options for you but we do not have exactly what you are looking for. The best option we have is the 2" Hitch Ball part # SC23-C which is made of stainless steel and has a 1" diameter shank. In order to then use this with a 1-1/4" diameter ball hole you would also need the Hitch Ball Bushing part # F-2. The Hitch Ball Bushing is zinc plated and unfortunately we don't have any that are stainless steel. We also have the Tow Ready Trailer Hitch Ball Cover part # 42250 as an alternative. 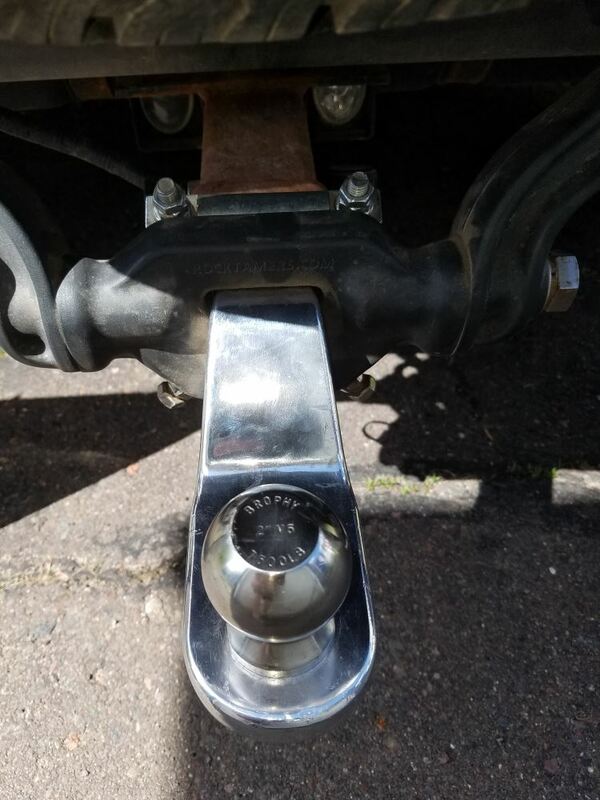 The Weigh Safe Replacement 2-5/16-Inch Hitch Ball Adapter # WS07 is specifically intended for use on their hitch ball # WSUN-1 but I did a test fit on the Brophy 2-Inch hitch ball # SC23-C and these items work together. This clamp-on adapter should not be left on the 2-inch ball unless the trailer coupler is connected over it. The adapter has a magnetic closure but this may not be secure enough to allow driving the vehicle without a trailer coupler to hold the adapter on the 2-inch ball. The standard ball hole diameter for ball mounts that fit 1-1/4 inch hitches is 1 inch like the 2 inch hitch ball part # SC23-C. Highest quality hitch ball for the best price. Most detailed, accurate hitch ball information available.